VISIONS OF THE NORTH: How did it all start? It's one of the first questions I'm always asked -- how did you come to develop this abiding fascination with the story of the Franklin expedition? And so of course I have an answer, one that -- while it's entirely true -- has grown a bit in the telling. Literary critic Hugh Kenner had a phrase for these sorts of tales -- things that might, or perhaps might not, be true -- but that certainly ought to be true! He called them "Irish Facts." So here's mine: many years ago -- circa 1992 or so -- I was a newly-appointed and hence very "junior" assistant professor in the wilds of central Maine, at a place called Colby College. It's a time when most people would be a little tentative, a little unsure of their steps. Fortunately, a more senior colleague took me under his wing -- a guy then known by the name of Jim Boylan, who's now far better-known as the bestselling author and New York Times columnist Jennifer Finney Boylan. Boylan and I, along with an equally freshly-minted geology prof by the name of of Paul Doss -- a man who could play a mean blues harmonica as well as he could catalogue rock samples -- decided, in that most ancient of traditions, to form a band. And our name -- I can't remember who came up with it -- was one of the great band names in all history: we were known as the Diminished Faculties. Later on, when a fellow from the IT department joined up, we became "The Diminished Faculties with Staff Infection," a more clever but somehow much less epic moniker. And it was in our quest for new material for this band that something happened -- something very small, but very consequential. Boylan had played a tune for me, "Arthur McBride," as performed by Paul Brady -- and I'd fallen in love with it. 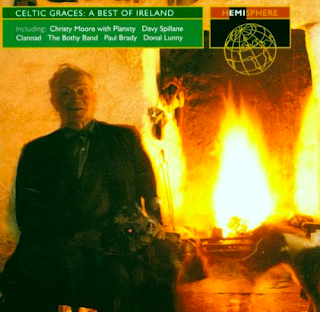 And so, the next time I had a chance, I stopped by the local record store and searched for it, finding it at last on an anthology CD named Celtic Graces. Pleased with myself for finding the tune, at some point I idly played the rest of the CD, and stumbled upon a song, "Lord Franklin," played by Micháel Ó'Domhnaill and Kevin Burke, which just captured me entirely. I found myself playing it over and over, and squinting at the finely-printed insert where, I was informed, Franklin's ships has been trapped in the ice for years, and all his men had died without being able to obtain any help. This stunned me: how could these men have been trapped in the ice for so long? It was a tale of loss, profound loss, with a mystery following -- why had not the ships been found? What had happened to these lost souls? And oddly, as fate would have it, I was soon to undergo an experience which resonated, in a curiously profound way, with this loss: I lost my teaching position at Colby. Perhaps it wasn't a complete surprise -- the campus and its faculty were always a little clubby, and I was never much of a joiner. I also had a tendency to call out what I saw as bad leadership -- I have a brief recollection of the college's president turning beet-red at a meeting at which I spoke -- no doubt I was a very impolitic junior professor. To be sure, such a fall from a position of relative privilege bears, in one sense, no comparison at all with such loss of life as Franklin's crews endured -- but somehow the common feeling cemented the bond. And it wasn't at all helpful that Colby's library contained, on its open stacks, every Franklin search narrative from Kane to McClintock to Hall to Schwatka. My office was in the library -- I'd been demoted to a former broom closet by then -- but I heaped my desk with these volumes, and let them lead me where they might. And here, to this extraordinarily rewarding and passionate interest, is where they have led me. How wonderful to finally hear the full story, complete with epic band name! Colby's loss is our gain. The Franklin story is one of those things where, the more you know about it, the more interesting it gets...and the more parallels you see with contemporary times. When the first three bodies were autopsied back in the 80s, I lived in Chicago following some record-breaking winters with -40 wind chill factors. So I empathized. And Barrow's obsession with the Northwest Passage? A good idea to occupy an excess of displaced naval officers or an impractical, deadly fantasy from a man who mainly sailed a desk for decades? Historical mysteries like this tell so much about their time. My fascination with the Franklin story started one damp Irish day when I asked my father = McClintock's grandson - WHY they all perished? WHY didn't the Inuit help? WHAT the hell happened? WHY WHY WHY? While living near snowy Buffalo in the early 1960s , we all istened to my Papa's Navy stories. I fascinated about myself going out and exploring the Yukon. Alas, I never made it that far. Next best thing, I became a Franklinite. Interesting how people get drawn to this. I rec'd a copy of "Frozen in Time" for Christmas back in late 80's and that started me off down this road. I never liked the standard reconstruction of the events, and Woodman's book only fueled that further. As an aside, I know a nurse who just returned from doing a stint in Gjoa Haven. She was amazed I could name places and events of where she was considering it is so remote to southern Ontario. She is now aware of my interest in that region!